It seems that despite fighting the war against SPAM for over 3 decades, our weapons for defence against it are still pretty ‘hit and miss’!! Tomes have been written about how to stop SPAM email so why am I adding to the clutter? This week several clients reported an increase in SPAM email. So, I thought it timely to provide an update on the ‘war’ and to provide some simple, read FREE, tips to help manage it. First of all, what is SPAM email? SPAM email can be defined as the indiscriminate sending of bulk unsolicited email messages. 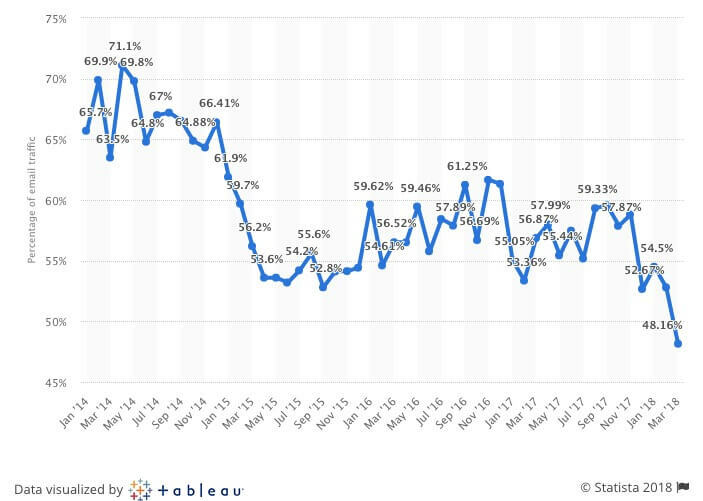 Global SPAM volume is down, compared to 4 years ago, but at 48% of global email volume, it’s still a very serious problem! WHY is SPAM a Problem? 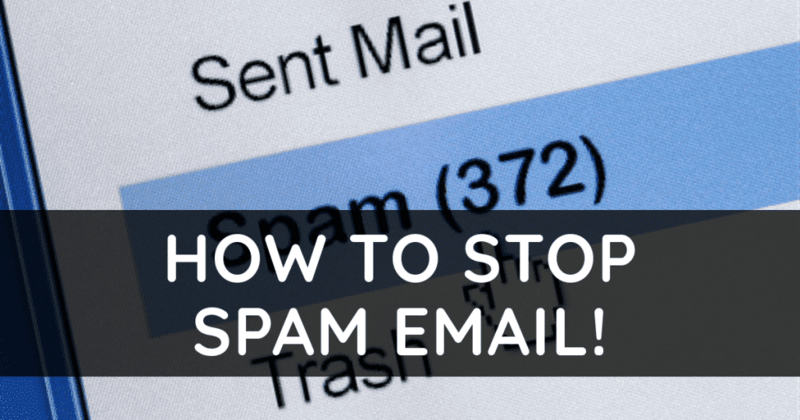 At it’s most basic level, SPAM is simply an annoyance for recipients, because it means that you have to stop what you’re doing and manually delete the unwanted emails from your inbox. At it’s most heinous, SPAM can be in the form of Malware (Malicious Software), or a means of tricking recipients into visiting scammers websites and handing over sensitive information in order to steal from their bank accounts as well as multiple types of identity fraud. The most common type of SPAM is advertising-related email; typically Malware, healthcare and dating / adult services. This is a relatively new SPAM email, reported to me by several clients recently. This is quite timely since Google Chrome is about to start marking websites as ‘Not Secure’! 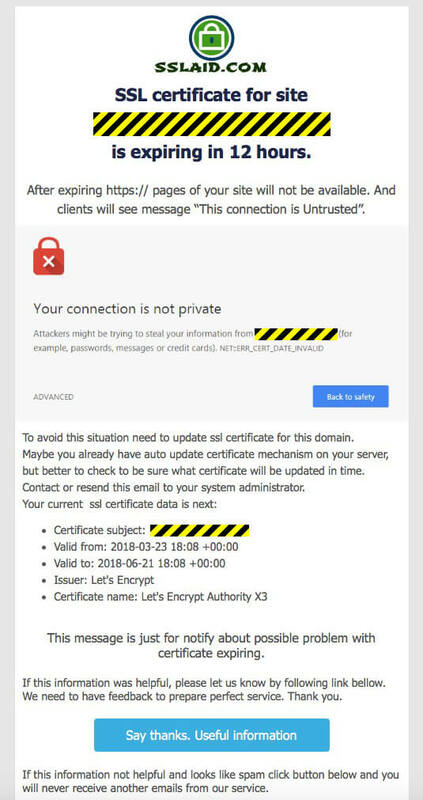 From July 2018 if a website fails to have a valid SSL Certificate and is not configured to serve content over HTTPS, your site visitors will be shown a warning. Need help? 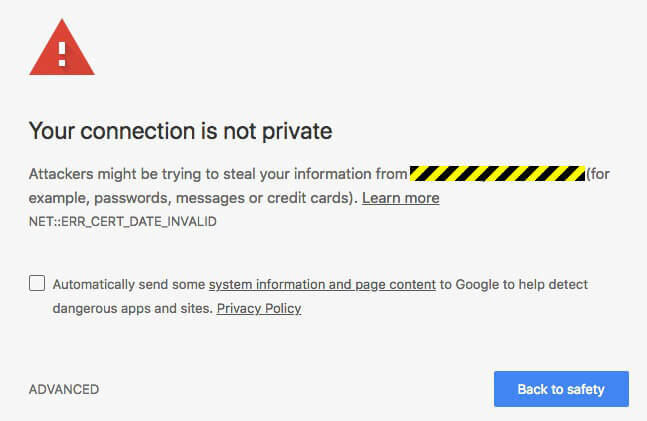 – Website Not Secure on Google Chrome? – How To Fix It! It appears that the spammers are scraping URL’s from the related Whois records of web host IP addresses, and running them through a simple tool such as SSL Shopper. This reveals the SSL Certificate information and expiry dates needed to then target site owners with an un-necessary ‘fear campaign’. Trust me, their website is also particularly ‘shonky’ (June 2018). I didn’t provide a link on purpose as I’d rather not send them free traffic on my behalf. If by chance this is your website/campaign, I make no apologies for ‘calling out’, what is in my opinion, a shonky operation! 2) 1000 New Customers Guaranteed! Whilst this particular email is new, the ‘hook’ certainly isn’t! Who doesn’t want 1000 new customers, right? When you work in Web Services you get to see hundreds of SPAM emails like this, so you get pretty ruthless at ‘weeding them out’. However, the lure of the ‘free lunch’ is obviously too much for some so the spammers prosper and multiply. What I particularly liked about this SPAM email was the address listed in the footer – Level 6, 140 Creek Street, Brisbane, QLD 4000. An entire floor??? It’s a co-working / shared office space…classy! Whilst you may never completely stop SPAM email, it can be successfully managed. Follow these simple steps to regain control of your inbox. 1) Treat Your Primary Email Address Like Gold! The more people, organisations and companies have your email address, the more SPAM email you will receive. If you need to provide an email address to sign up for newsletters, company promotions and various other ‘free stuff’, use a FREE email provider such as Hotmail, Gmail or Yahoo etc. You can have as many as you like, so if SPAM becomes a problem just delete it and start again. If you ever need a ‘one off’ email address, give ThrowAwayMail a try. They’re FREE, web based, last for 48 hours and are randomly generated so there is no correlation to your real identity. The more SPAM email you see the better you get at identifying it, before opening it. Look at the SENDER information. In the first SPAM email above it was info.mg.sslaid.com. If you don’t recognise the sender there’s a good chance it’s SPAM. If these informations not helpful, and looks like spam click button bellow and you will never recieves another emails from our service. If you do open a SPAM email by accident, don’t click on any of the images or links, or download any files. Simply close it, mark the email as both ‘Unread’ and ‘Junk’ and let your email client do the rest. If you opened the email because it appeared to be coming from a friend or co-worker, contact them immediately and let them know that their account may have been compromised. Laws vary depending on where you’re located, but in most cases commercial email senders must provide the recipient with a ‘one step’ way to opt out of receiving their emails. The most common type of opt-out is an unsubscribe link; usually found at the bottom of the email message. When you click on an Unsubscribe link, you’ll be taken to a URL that confirms you no longer wish to receive emails from the organisation. Be very careful using the Unsubscribe link! SPAM messages often include them as well. However, instead of taking you to the unsubscribe page, you’re merely confirming to the spammer that the email address is active. Worst case scenario, you will be taken to websites that attempt to load Malware or steal sensitive information. One trick I use is to hover my cursor over the Unsubscribe Link; this displays the actual URL. I can then decide if I think it’s legitimate or not. Most commercial email hosting providers offer sophisticated email filtering software to help prevent client accounts from being hacked and or compromised through bandwidth abuse. Take advantage of everything they have to offer. If you can stop SPAM at the hosting server level, you have less to deal with at email client level. SiteGround use a particularly good piece of software called SPAM Experts. The control panel looks a tad daunting but there’s an incredible amount of functionality available if you take the time to learn how to drive it. Even if you only use the ‘Whitelist / Blacklist’ features you’ll be ahead of the game in SPAM control. 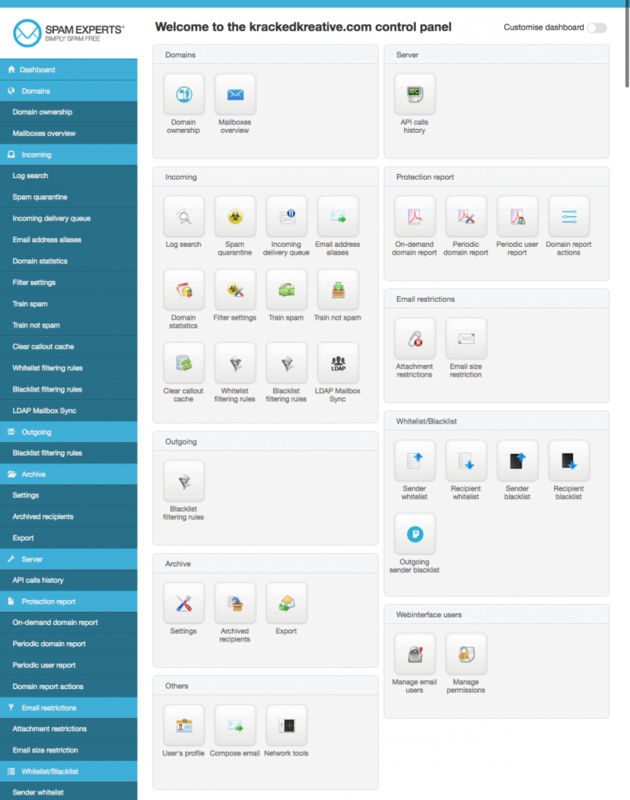 If you are with SiteGround and would like a hand setting this up, just drop me a line or give me a call, I’d be happy to help. Once SPAM gets past the email server, the next line of defence is your email client. Modern email clients have a built in SPAM filter and in most cases this filter is capable of ‘learning’ to recognise SPAM and placing it in your SPAM or Junk folder. You can help to train your filter by telling it that the email is SPAM. When you find spam in your inbox, don’t just delete it. Select it, and tell your mail client that this particular message is spam. How you do this depends on your particular email client, but the rationale is the same. Go through your SPAM folder once a month to identify any messages that are not SPAM. 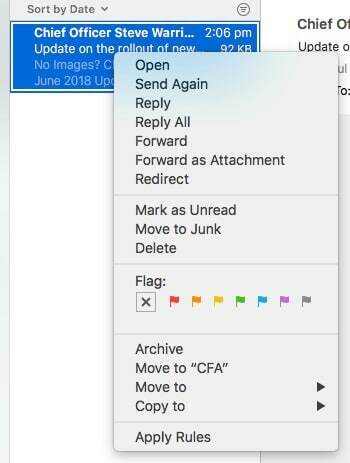 If it’s not SPAM, just click ‘Move to Inbox’ and your email client will ‘learn’ to trust messages from this sender in future. 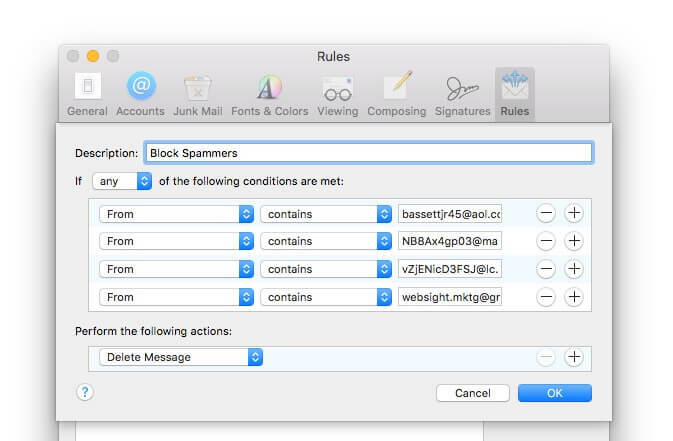 In most email clients you can set rules that filter incoming messages and mark them automatically as junk or throw them into the trash. I have a few persistent spammers who, for some reason, aren’t automatically marked as spam and haven’t been shut down despite operating openly from the same address and domain. Tired of marking by hand, I created a filter for their email addresses that automatically deletes the message. A drastic option, but if you’ve found your email address getting overwhelmed by SPAM, it’s often the only option left. You’ll need to inform your contacts of the new address, and keep both addresses for a few months to ensure that you don’t miss any. Once you delete the old address your SPAM volume should plummet. Once you’ve gone through the steps to prevent SPAM, go the extra step and report it to your National Communications Authority. No doubt they receive thousands of complaints but if they don’t know about the SPAM they can’t take steps to eliminate it. By implementing some of these techniques you’ll be able to manage your war against SPAM and regain control of your inbox. If you have concerns about SPAM email and you’d like some help in handling the technical aspects for you; just click on the button below and drop me line, or give me a call. I’d be happy to help. 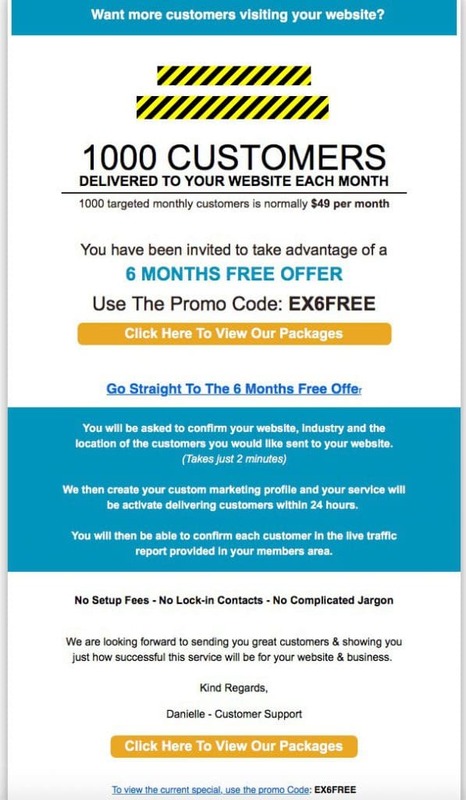 PS: Don’t try these sorts of SPAM email tactics as part of your email marketing campaign! It’s no fun getting your domain related email address off a blacklist, neither are the fines you’ll receive if/when you get caught. If you’d like some guidance in setting up a legitimate email marketing campaign, drop me a line.